Reading the title of our first blog article of 2018, one may be forgiven if one thinks the "Singapore Jays" is a musical rock band or something like that. 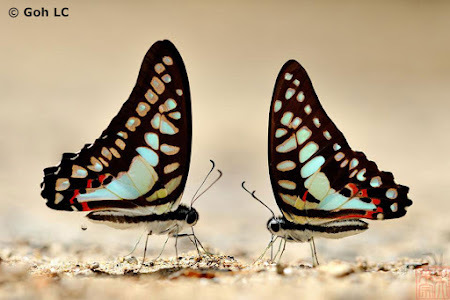 But the pun-ful title is purely coincidental, as in this instance, we are referring to a group of butterflies that are collectively referred to as "Jays". 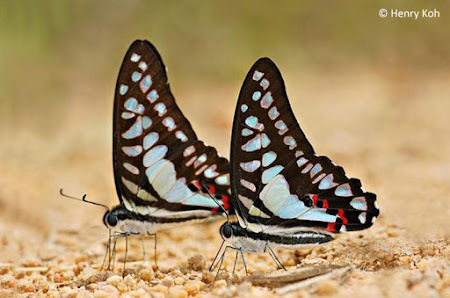 These species belong to the genus Graphium in the family of Birdwings and Swallowtails (Papilionidae). The Jays are very fast-flying and skittish butterflies with unique triangular-shaped wing forms that are predominantly blue or green in colour. 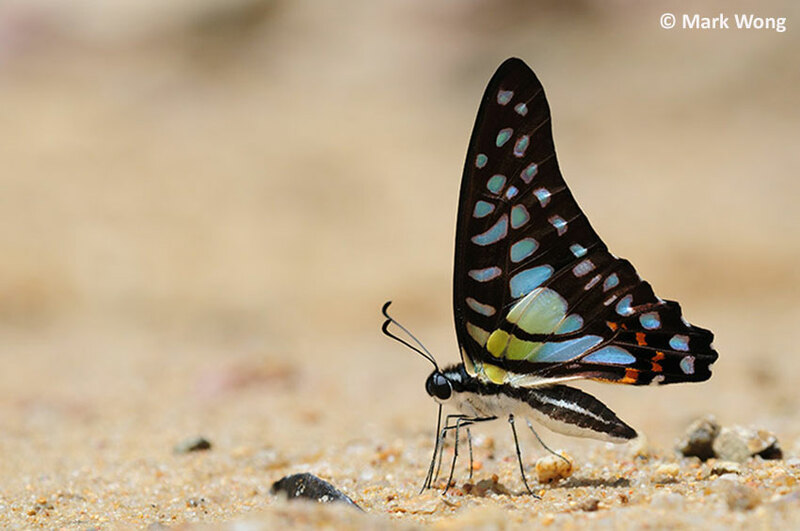 Over the years, three extant species have been found in Singapore - the Tailed Jay, Lesser Jay and Common Jay. Subsequently, in 2014, another two Jays found their way into Singapore and have been added to the Checklist. 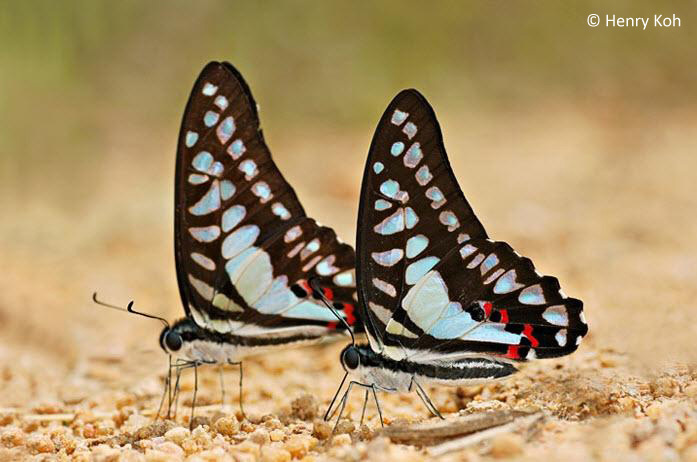 Although these two latter species - the Great Jay and Striped Jay are considered seasonal migrants, they are not uncommon up north in Malaysia. 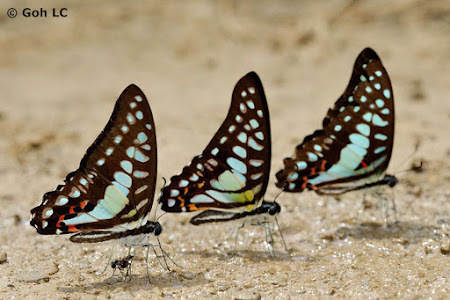 The males of these Jay species have a common behaviour in that they are often drawn to puddle on urine-tainted sandy streambanks and damp patches of sand or soil that is rich in animal excretions or decomposing organic matter. 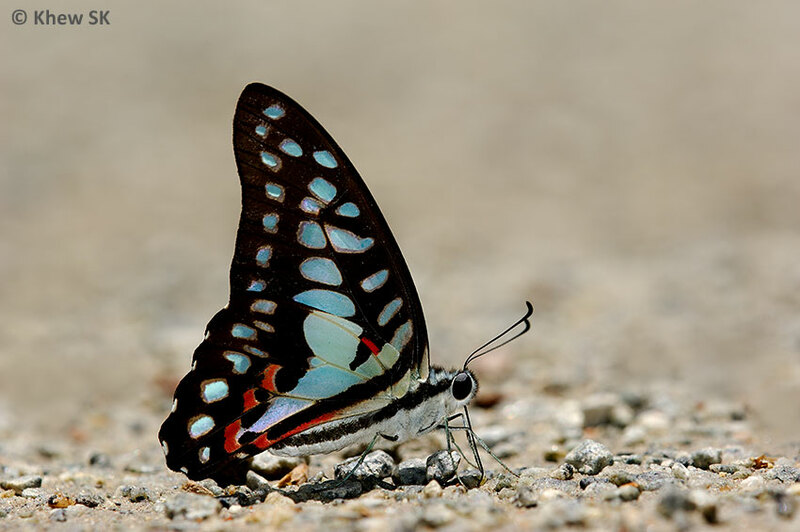 Being fast-flying and skittish, it is only when they are puddling when a photographer gets the best odds of photographing them with much less frustration. Occasionally though, they stop to perch on the nearby shrubbery after gorging themselves on their liquid diet. This blogpost introduces the five recorded species of Jays in Singapore and shares some of their behaviour and unique characteristics, host plants and how to distinguish between those species that are very similar in appearance. The first of our five Jays, the Tailed Jay is the easiest to identify and is distinctively different from the other Jays in that it has green spots on its wings. 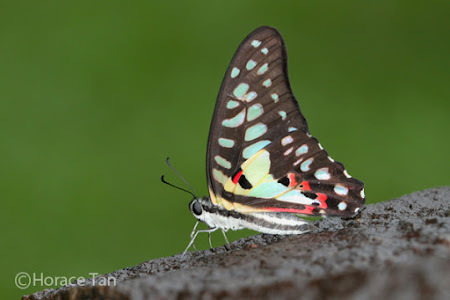 It cannot be confused with any of the other Jay species found in Singapore. However, a similar looking species, the Spotted Jay (Graphium arycles arycles), flies in Malaysia and has yet to be found in Singapore. 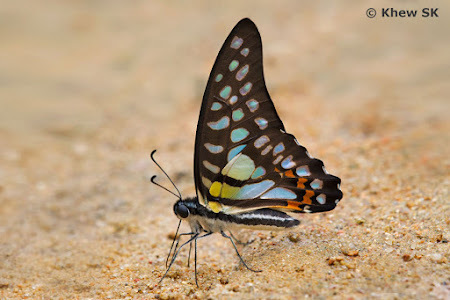 The Spotted Jay lacks the tails at vein 2 of the hindwing of the Tailed Jay, but is similarly coloured. 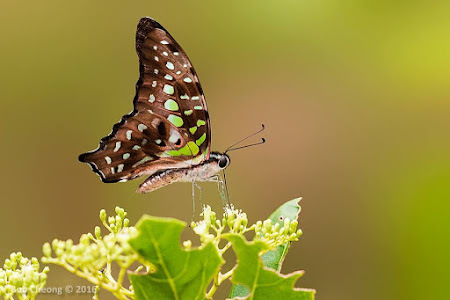 The Tailed Jay is considered an urban butterfly here in Singapore, where it is often seen in the vicinity of its host plants - Soursop, Champaca and Ashoka Tree, all of which are cultivated and planted along roadside verges in urban Singapore. 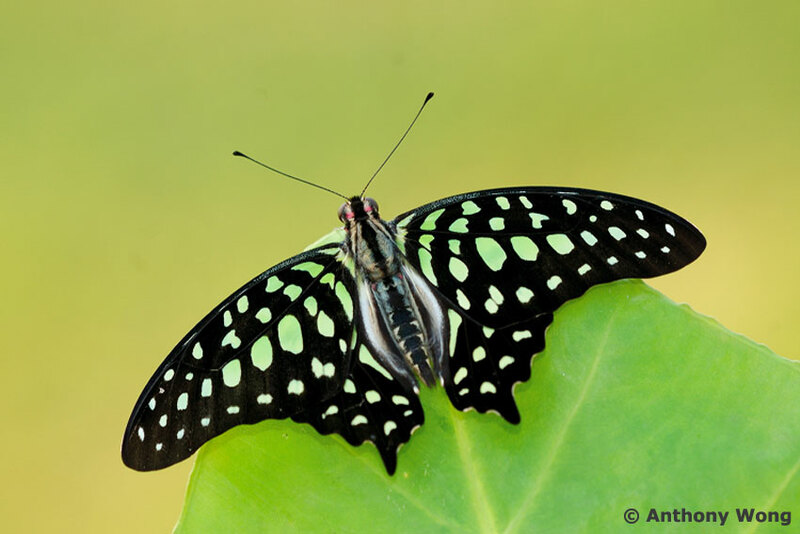 As its caterpillars feed on a wide variety of host plants, of which two more are found mainly in the forested nature reserves, the Tailed Jay has a widespread distribution from urban parks and gardens to the forested nature reserves. It is a fast flying butterfly and often seen feeding at flowering plants more than puddling at sandy streambanks. Females are typically larger, and have longer tails than the males. The upperside of the Tailed Jay is dotted with emerald green spots on a black background. 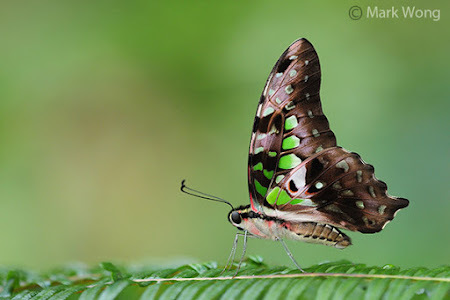 The underside features a purple-brown ground colour with green and red spots. The Lesser Jay, sometimes referred to as the "Blue Jay", is a forest-dependent species and is most often encountered within the forested nature reserves of Singapore. 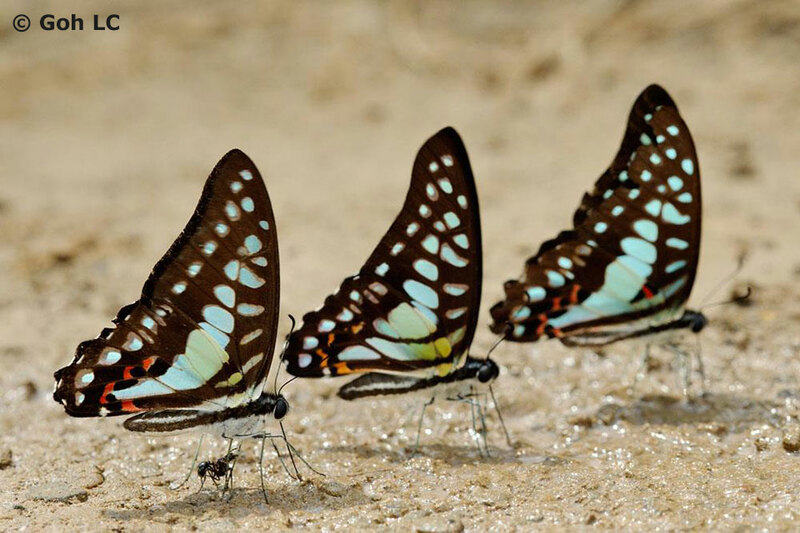 Where it occurs, it is common and at times, several individuals can be encountered puddling together. It has a rapid and erratic flight and is skittish. 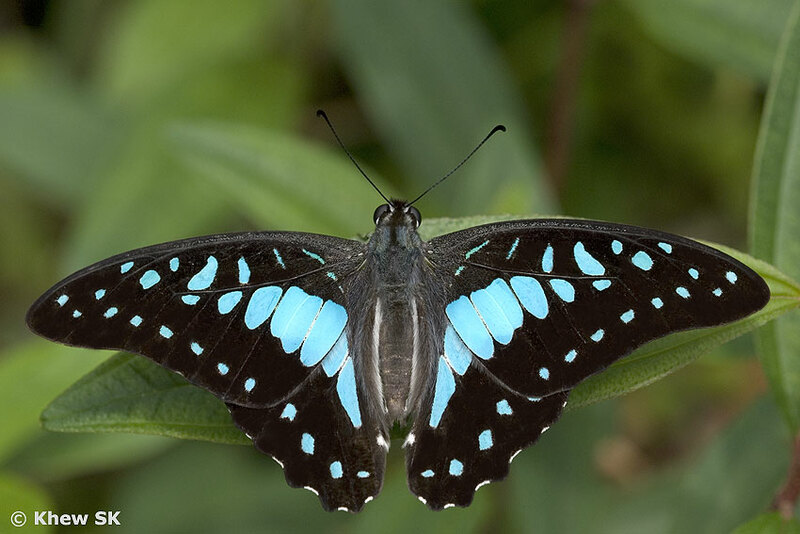 The butterfly's wings are black above, with a blue macular band that runs across the fore and hindwings. There is a series of blue submarginal spots. The underside is a pale silvery blue with deep red spots at the sub-tornal area of the hindwings. 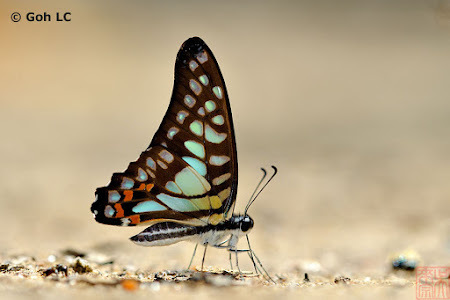 The Lesser Jay can be identified by the black costal bar on the underside of the hindwing, where it is united with the basal band. The early stages of the Lesser Jay has been documented successfully and the caterpillar feeds on Artabotrys wrayi (Annonaceae), which is essentially a forest plant. As such, the butterfly is more often observed in the forested areas of Singapore and rarely seen in urban parks and gardens. 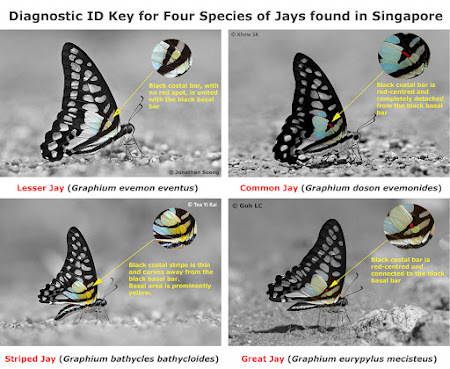 The next extant Jay species that is regularly observed in Singapore is the Common Jay. This species was first observed on the island of Pulau Ubin in 2004 and has largely remained on that island to this day. 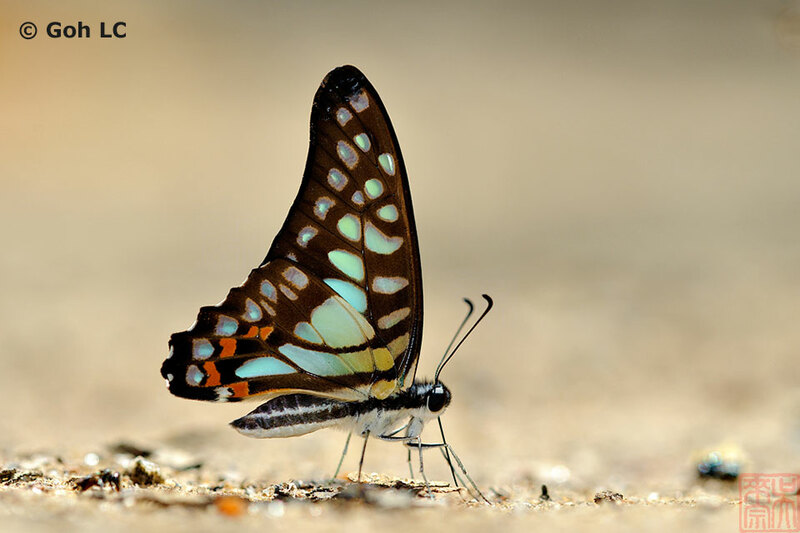 Although there have been sightings of the Common Jay on Singapore island, it is more often seen on Pulau Ubin, where its caterpillar host plant grows. The Common Jay is almost indistinguishable from its lookalike cousins when in flight. 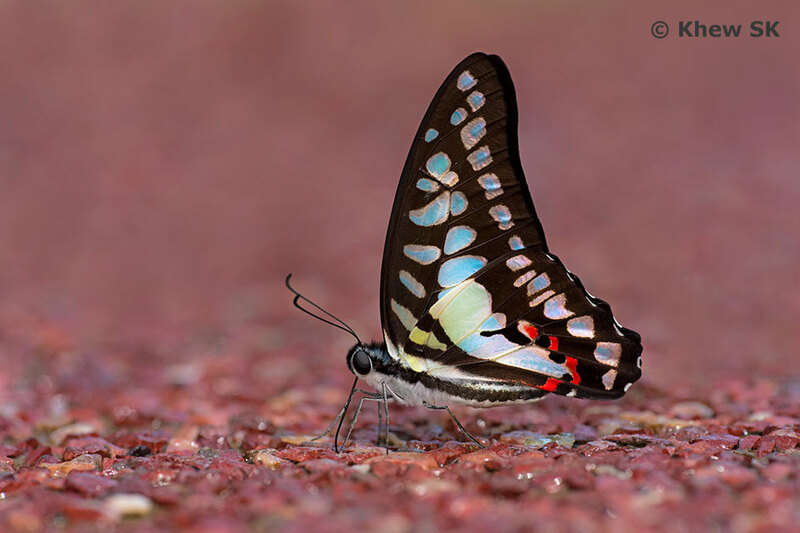 The typical black wings with a blue macular band and submarginal spots on the upperside makes it almost identical to the other species. However, on the underside of the forewing, the red-centred costal bar is separated from the black basal bar distinguishes this species from the others. The Common Jay caterpillars have been successfully bred on Desmos chinensis (Annonaceae, common name: Dwarf Ylang Ylang), Michelia alba (Magnoliaceae, common name: White Champaca), Polyathia longifolia var. pendula (Annonaceae, common name: False Ashoka Tree). The Dwarf Ylang Ylang appears to be its preferred host plant that is found on Pulau Ubin. The next lookalike Jay species is the Striped Jay. This species was only observed some time in 2014 with a good photo record of it. There were some claims that it was also shot here in Singapore previously, but the records have not been validated. 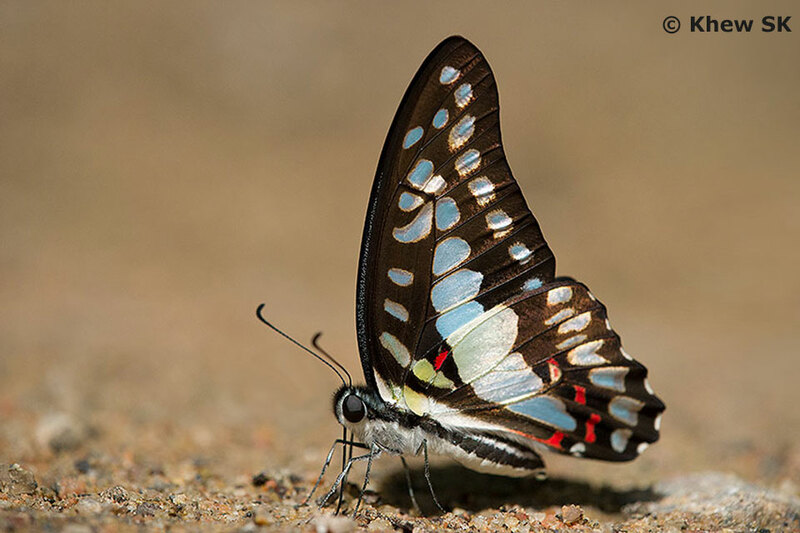 The observation in 2014 was within the nature reserves area where the butterfly was puddling at a sandy streambank. 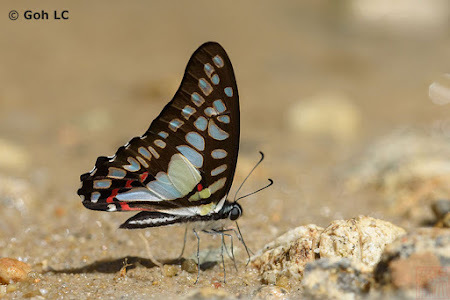 Again, in this species, the black upperside with a blue macular band and submarginal spots make this species almost identical to its cousins in the genus. The basal area on the underside of the wings is prominently yellow. The diagnostic feature for this species is the costal stripe which is thin and curves away from the basal bar. The Striped Jay is common in Malaysian forests where several individuals are observed puddling together. 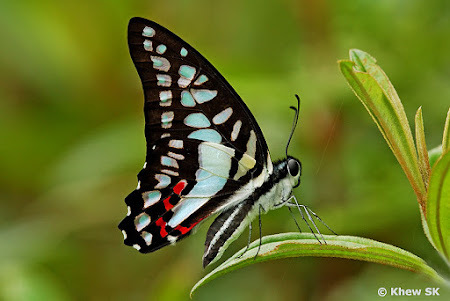 There is another closely related Jay that is very similar to this species called the Veined Jay (Graphium chironides malayanum). 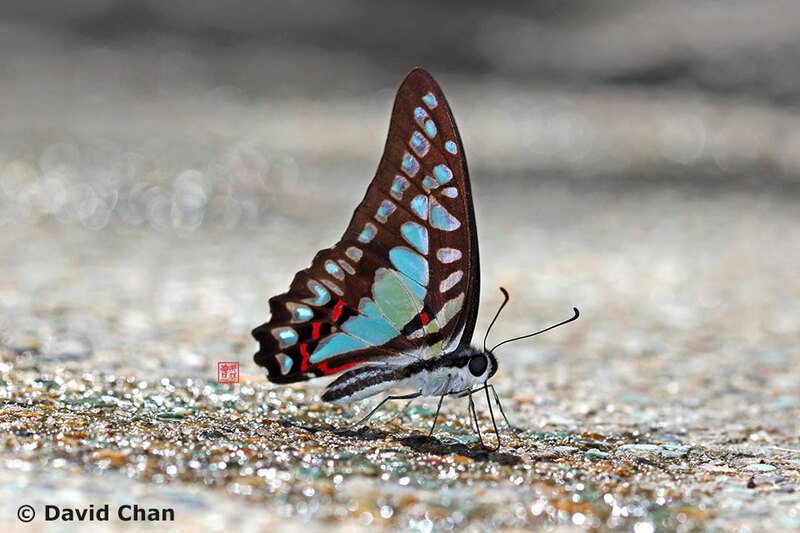 However, this species has not been seen in Singapore yet. The last species of the Jays observed here in Singapore is the Great Jay. Coincidentally, also spotted in 2014 around the time when the Striped Jay was seen in Singapore, the Great Jay is superficially similar in appearance to the previous three species discussed here. It sports the same black upperside with a blue macular band across both wings, with blue submarginal spots. Like its other cousins, the Great Jay is often photographed whilst puddling on sandy streambanks in forested areas. The skittish, fast-flying species often puddles together with its other cousins and many other species that like to puddle in numbers. 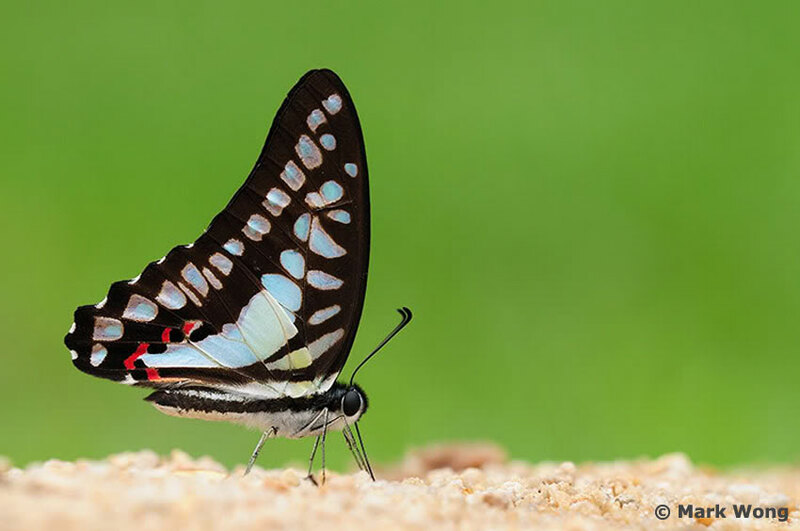 The distinguishing marking on the underside of the hindwing is the red-centred costal bar with is conjoined with the basal band. The Great Jay and Striped Jay are not considered "resident" species but have been recorded on the Singapore checklist as seasonal migrants. 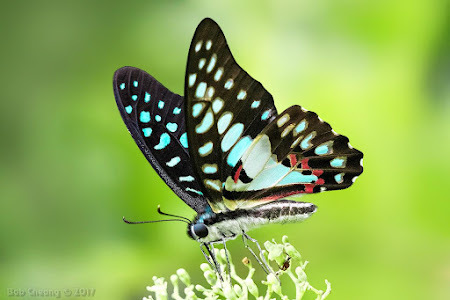 Until a viable colony can be established, they are likely to be seen only occasionally when the conditions are conducive for them to fly over from the neighbouring Johor forests. So in summary, a visual guide showing the diagnostic features on the underside of the hindwings of the Lesser, Common, Striped and Great Jays is included here for reference. So when you are out in the field, observing some of these lookalikes, do try to spot these features to help you identify which of the Jays that you have encountered.